Yes, many animal species in the wild catch and kill snakes. Some of these species can even be trained in the art of snake extermination! 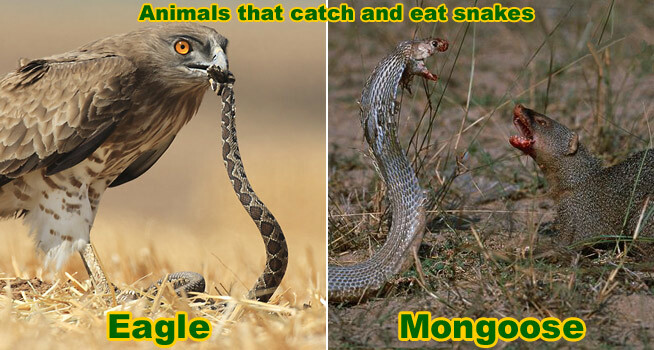 Animal types that hunt and kill snakes include many species of raptors - eagles and hawks, honey badgers, and of course the notorious mongoose. King Snakes eat only other snakes. And believe it or not, common house cats and dogs catch and kill snakes too. Some species of dogs can be trained to catch and kill snakes. What animals keep snakes away - First of all, no common house pet will keep snakes away without special training, and even then, you put the animal at great risk. Cats and dogs may do a decent amount of snake hunting, but they will not actively patrol your property just for snakes. You will have to take into account, too, the fact that any house pet exposed to snakes will also be prone to bite injuries. If you live in an area with venomous snakes, this can be disastrous. Pigs have been known to kill snakes, but again, these animals are not hunting the snakes, rather they are reacting instinctively and stomping the serpents when the opportunity presents itself. The mongoose is a pet that does have special attributes specifically for snake hunting and killing. These weasel-like animals eat snakes, and have special genetic attributes that make them immune to venom. The mongoose is very agile and has a thick coat, making it a perfect combatant for snake wars. The downside to the mongoose is that it’s importation to countries where it is not native is strictly regulated. The diet of the mongoose makes it a habitat destroyer when it is introduced into new environments. The urine of a mongoose can be used to repel snakes with some efficacy, but this is also not available to the public. Read the story of what happened when I brought a snake into the house, and it encountered my fluffy white pet kitten: house cat vs snake, with photos. Why do snakes get scared of mongoose - It’s not necessarily that snakes become frightened when they smell a mongoose as much as they become wary. The mongoose is a fantastic little animal, resembling a stocky weasel and acting with prairie dog-like communication skills. It is naturally immune to snake venom and hunts serpents as a main food source. Mongoose urine has been used to repel snakes with moderate results, though the product is not available to the American public. Many countries in Europe and Asia keep mongoose as pets for the purpose of warding against snakes. Due to the little animal’s tendency to eat other creatures, its importation into other countries has been regulated. Some areas have experienced significant ecosystem damage from non-native mongoose population. Even a mongoose will not keep all snakes away all the time. Just like with an predator, the snake will acknowledge the mongoose scent, but unless it sees on, it may just proceed forward with caution. Many people are aware by now that the Honey Badger of Africa is a notorious snake hunter, and that it is relatively immune to snake venom. They can even hunt and kill cobras. Click here for photos of Honey Badgers hunting and killing snakes. What dog keeps snakes away - There are no dogs that are born with an insatiable desire to hunt and kill snakes, largely because snakes are not a part of the canine diet. There are certain breeds with stronger hunting instincts than other, like the Rat Terrier or the Airedale. These dogs will be more inclined to chase and kill a small, moving animal, but they will not patrol your property specifically looking for snakes. Keep in mind that any dog will be subject to the bite wounds that come from tangling with snakes around the yard. Animals are just as prone to infection as humans, and a dog with multiple puncture wounds will need frequent veterinary visits. The cost of this constant care will quickly outweigh any benefit the canine has as a rattlesnake hunter. Some dogs will even avoid snakes after being bitten. If you bought the dog strictly for snake hunting, that’s a touch pill to swallow. Now, you will have a dog and you will have snakes still in the yard. The only pet that is really effective against snakes is the mongoose; however, their importation into North America has been prohibited due to the little critter’s habit of taking over ecosystems. Snake fear pig - Snakes do not naturally fear pigs, though pigs and many hooved animals fear snakes. This is what leads to the volatile responses from animals like the pig when a snake is seen in the pen. Pigs don’t like snakes because both animals are close to the ground. The last thing the pig wants is the snake to injure one of its young. For this reason, pigs are instilled with a deep desire to run down any snakes and stomp them to death. It has nothing to do with snakes and pigs having a vendetta. Snakes are simply known predators of baby animals, and the pig is aware of this. The snake will not be fearful of the pig as long as the larger creature keeps its distance. This is how most animals are, and this is why many predator decoys and urine repellents fail to do any good. Animals, even natural enemies, will tolerate one another’s presence if no immediate threat is felt. A snake can pass through a pig’s territory, but if the serpent gets too close to something important, the pig will let it know. Keeping pigs on your property will not keep snakes away. Pigs are not snake hunters, and they will not spend much time or energy looking for a fight. Who is the enemy of snakes? Although a ton of animals prey on snakes, from owls, coyotes, bobcats, foxes, raccoons, weasles, snapping turtles, alligators, even crows, it is not easy to come by trainable pet animals that eat snakes, if you're looking for a type of animal that kills rattlesnakes or any venomous snakes, to help you with a snake removal project. It's not a common or practical thing done, and I know of no special trainer, service, or company that offers animals to control snakes, or training for dogs or cats to catch and remove snakes. I did once see a Secretay Bird in a zoo that was great at catching snakes and well trained, but I doubt you're going to go to your local pet store and pick up a Secretary Bird, Snake Eagle (Circaetus), or even serpent hedgehog. Your best bet for snake control is either of the below options. If a snake is indoors, a trap will work. I do not recommend using a glue-based trap outdoors, because it can inhumanely catch other small critters. I have reviewed and field tested several snake trap designs, and the one featured below is the most durable and effective. It is the highest quality snake trap available on the market. Read more about Snake Trap. What animals catch and kill snakes? There are a number of animas which act as predators for snakes, despite what you may have thought. Humans are one of the biggest culprits, catching them with the intention of breeding them for pets, often causing their death or ill health because of poor care or cramped living conditions. Humans often run over wild snakes with their vehicles, and also kill snakes in the process of trying to ‘evict’ them from residential properties. Humans aside, eagles and hawks are well known for killing snakes, and for some of the bigger birds of prey, snakes actually make up the bulk of their daily diet. They can easily spot their slithering targets from up high in the air, something humans don’t have the advantage of back down on ground level. There are some mammals which will catch and eat snakes too - bigger snakes will often eat the smaller snakes, it’s a dog-eat-dog world after all, and foxes and weasels have been known to catch and eat ones they can easily overpower. Moving out of the US and looking around the world, even the biggest and most dangerous or venomous of snakes have their predators. If you were to head to Africa or Asia, for example, leopards and crocodiles would be big enough to catch and eat the biggest of snake species, and in Asia specifically, the mongoose often chooses snake as it’s dinner of choice. Even jaguars and other big cats won’t turn down the chance of a snake meal, South America seeing this with the larger anacondas.